Mahalo Nui/Big thanks for making Spiral Dance extra special and extraordinary this year! There was so much love and support in the room and such big mana and magick. My cup is still overflowing. It was fun to think about this being the 20th Spiral Dance I have led in Orinda. Where have the years gone! I met with Lynda and Maria Yraceburu the next day and we were talking story about how wonderful it is that our community is attracted to the old indigenous ways, and the old ways of making magick and ceremony. What is remembered lives! It always pleases my soul to see that no matter how much has been conquered we continue to persevere and rise up! 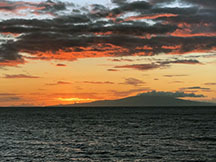 Ashe, Mahalo, Aloha, Blessed be! We now have the opportunity to gather again in a more intimate setting. Tuesday, November 6, 2018, 7:30 p.m.
Ixchel, represents the phases of the Moon and the phases of Womanhood: Through Her maiden face, Young Moon Goddess, She is the life giver; as Mother the Weaver and She who sets the Universe in motion; and as Old Moon Goddess/Chak Chel, Midwife of Creation. She is symbolized by Water, Weaving, Rabbits and Childbirth. Lady of the Rainbow, She is founder of the city Palenque and Her sacred island is Cozumel off the coast of the Yucatan Peninsula. In ancient times and today, women make pilgrimages to Her Temple there for fertility and abundance and a fruitful marriage. I made this pilgrimage with my own daughters Jade and Eden in 2008 with their dad and the land is Holy and She is Alive. Ixchel holds the center of the Universe as She weaves with Her whirling drop spindle. One of Her names is Ix Kanleom, the ‘Spiders Web Catching the Morning dew’. She is Creatrix of beauty and strength and Female Mysteries. As ancient one, She is midwife to younger birthing women and pours water from Her jar marked with the glyph for water like frescoes found at Cacaxtla, Mexico. On the other side of the Yucatan, Chontal province of Acalan/Itzamkanac Ixchel was venerated as a main deity. One of Acalan’s coastal settlements was called Tixchel, ‘at the place of Ixchel’. 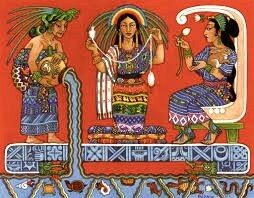 Her gorgeous magickal gifts of weaving are still bestowed and practiced in modern Maya traditional clothing. Her sacred craft and handwoven textiles can be seen in remote areas of Maya country-mostly modern-day Guatemala. What are you weaving into creation? How do you hold your spindle of creation within our Universe. Learn more about Her, your own power and how to prepare ourselves as community for the next age of creation. Please bring a beautiful candle for the altar and any of Her symbols. Also, please bring anything you have created with your own hands from any form of textile or one that you treasure and have collected over the years. Bring, thread, needles of any kind, yarn and anything that can be sewn, woven, crocheted or knitted. Do you have a grandmother’s scarf, blanket, pillowcase with embroidery? Please bring these kinds of things to be blessed, honored and inspired by!